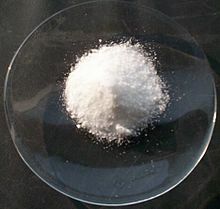 Potassium chloride is a chemical compound. Its chemical formula is KCl. It contains potassium and chloride ions. It is a colorless crystalline solid. It is not reactive. It is similar to sodium chloride. It reacts with silver nitrate to make silver chloride. It reacts with sodium metal when very hot to make potassium metal. The metals are a gas because it is so hot. It makes a pink color when heated in a flame. Potassium chloride is found as a mineral. The mineral is called sylvite. It is also found in sylvanite, a mixture of sodium chloride and potassium chloride. It is taken from the ocean. It can also be processed from the mineral sylvite or sylvanite. It is made when potassium nitrate is reacted with hydrochloric acid, making nitric acid and potassium chloride. It is made when potassium burns in chlorine. It is used to make potassium metal. Potassium chloride is heated very hot until it melts. Sodium metal is reacted with it. The sodium metal melts and boils to make sodium gas. The sodium gas reacts with the potassium chloride to make potassium gas and sodium chloride. It can be electrolyzed in a water solution to make potassium hydroxide. It is used in food processing. It can be used to execute people in a lethal injection. It is used instead of table salt sometimes. Normally it is half table salt and half potassium chloride. It can be used to extinguish fires. It was used to make packs that get hot when squeezed, but better chemicals are used now. Potassium chloride is toxic in very large amounts. When injected into a vein it is much more toxic. In the United States, people sentenced to death by lethal injection have usually been executed using three different medications. Potassium chloride is the third medication. It is given after a sedative (to put the prisoner to sleep) and a medicine that paralyzes the prisoner. Potassium chloride works by speeding up the heart until it stops. The use of potassium chloride in lethal injections is controversial. For example, one scientist who studied the three-drug combination called potassium chloride "extremely painful." United States Supreme Court Justice Stephen Breyer used her research to argue that lethal injection is cruel and unusual punishment. Other doctors agree that if the drugs are not given correctly, a prisoner could experience "a great deal of pain" or "excruciating [terribly painful] suffering." However, other doctors say that lethal injection is less painful than other ways of executing people, like using an electric chair or a gas chamber. They also say that if the three drugs are given correctly, lethal injection should be pain-free. Because doctors are supposed to "do no harm", many executions are now done by people who are not doctors. Supporters of lethal injection say that mistakes, not the drugs themselves, are what cause pain. ↑ 1.0 1.1 1.2 Teresa Zimmers, University of Miami Miller School of Medicine. Interview with Larry Greenemeier. Cruel and Unusual? : Is Capital Punishment by Lethal Injection Quick and Painless?. Scientific American. October 27, 2010. Assessed on April 7, 2016. ↑ 2.0 2.1 Gawande, Atul; Denno, Deborah W.; Truog, Robert D; & Waisel, David (January 31, 2008). Physicians and Execution – Highlights from a Discussion of Lethal Injection. New England Journal of Medicine (358): 448-51. doi:10.1056/NEJMp0800378. This page was last changed on 7 April 2016, at 11:24.